The paper reports on the epidemic of obesity among Neapolitans. A survey of 659 Neapolitan men showed that 50% were overweight with 16 % of that group being ranked as obese. Among 6,300 women in the study, 43% of the women between ages 40 and 59 were 19% over their ideal body weight; between ages 50-64, 46% were 27% over their ideal weight. The numbers for children are especially alarming, and I think the paper has made a mistake, or at least made it difficult to interpret. They say that "between the ages of 6 and 11, the 'obesity rate' is 23%". That is unclear to me. Are 23% of children between the ages of 6 and 11 obese? That would be a disaster, I think. Anyway, I haven't seen that many roly-poly kids bouncing around the streets. But you never know. On the same page is an entire article devoted to the opening of a new fast-food chain in Naples. This one is Pans & Company, a Spanish company that will open franchises shortly at four locations in Naples. It is part of a plan to have 20 such eateries in the Campania region up and running within the year. They will employ about 500 young people just entering the job market with low-level managers going to Barcelona for a period of training. 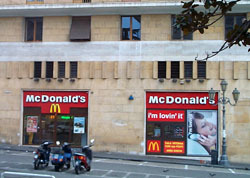 The obvious comparison is with McDonald's, which has opened a number of places in Naples in the last few years. The Spanish competition in Naples is really an extension of a campaign started ten years ago in Spain to provide a so-called "Mediterranean diet" within a fast-food format—or, as the paper says, "bocadillos instead of hamburgers". 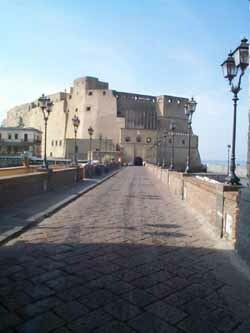 Yesterday, I tidied up a few loose ends in my mind concerning the Castel dell'Ovo (Egg Castle) in Naples (see here). First of all, on the ramparts are some cannon positioned such that they would fire in at the city and not out to sea (as one might expect in a fortress meant to protect against attack by naval forces). It turns out that the ones you see up there today were put there for ornamentation, having been recovered from the bottom of the bay of Naples at a point some ship went to a watery grave centuries ago. Yet, tales of guns from the castle taking pot-shots at the city are not entirely false. 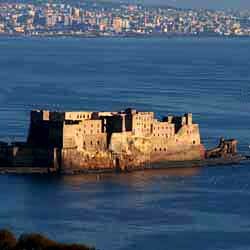 Around the year 1500, when the French and Spanish were belligerently disputing the future of Naples, the Spanish parked their artillery on the height of Mount Echia, the cliff directly across from the small island of Megaride (where the Egg Castle is situated)—only about 200-300 yards as the crow flies—and shelled the Angevin French in the castle, who, of course, returned fire. The only thing that would happen today if you could fire those cannon would be that you would take out the row of luxury hotels that have sprouted like poisonous mushrooms since the new seaside road was built a century ago. They are so tall that they obscure the original cliff face of Mount Echia, the height that was so enchantingly beautiful 2,500 years ago that the Greeks chose it for their city, Parthenope. One barrage would do it (see photo, above). Virgil is said to have taken the first egg laid by a hen, put it in a glass amphora, and placed that in a finely wrought metal cage suspended from a beam braced against the walls of a small secret chamber built especially for that purpose within the castle. As long as the egg remained intact, the city was safe. 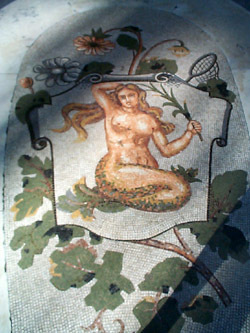 Virgil, thus, joins the list of select protectors of the city, including the original siren, Parthenope and the more recent Christian protector, the patron saint of Naples, San Gennaro—St. Januarius. Interestingly, even if there were an egg in that castle, it would be a second generation one. At the time of Queen Joan I of Naples (1326-82)—shortly after the Chronicle of Parthenope was written—a devastating storm wrecked much of the Castel dell'Ovo, even destroying the natural arch that joined the two parts of the island. Joan had to ensure the population that it was because the egg had broken, but that she had personally gone through the same magic ritual as Virgil, putting a second protective egg in place in the same spot. The populace was calmed. If it weren't for Mt. Vesuvius (and other volcanoes, I suppose), I would not have found out how the gruesome gladiatorial games that the Romans enjoyed so much came to an end. In researching the Geology of the Bay of Naples, I came across abundant material, of course, on the atmospheric effects of volcanic eruptions. Somewhere, I had read a verse by Tennyson, used (in the source I filched it from) to describe the eruption of Krakatoa in the late nineteenth century. Been hurled so high they ranged round the World? The wrathful sunset glared.' "
I left it at that, just the way I had copied it. It sounded good and very Krakatoa-like. However, just the other day, a kind gentleman from Japan, Dr. M. Iguchi from Tokyo, wrote me and asked (1) if the use of word 'World' was correct, for he recalls reading the same verse with 'globe'', and (2) if I would be so kind as to tell him if that was the entire poem or if it was an excerpt from a longer work, and, if so, which one? To work, to work. Indeed, I had misquoted the line. (But, of course, it is really the fault of the person I copied it from!) It is, in fact, 'globe'. 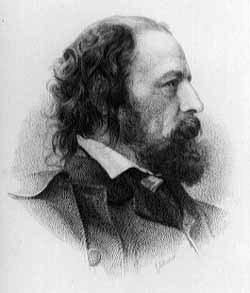 The four brief lines come from a much longer poem (80 lines, in all) by Tennyson. The poem is entitled "St. Telemachus" and is from Tennyson's last published volume, The Death of Oenone, Akbar's Dream, and Other Poems, which appeared in 1892. Been hurl'd so high they ranged about the globe? Fasted and pray'd, Telemachus the Saint. St. Telemachus, also known as Alamachius was a monk who was called by an inner voice to go to Rome in about the year 400 a.d. His attended a gladiatorial combat and tried to stop the combatants from killing each other. He was stoned to death by the angry mob, but the emperor Honorius (who ruled from 395 to 423), a Christian, got the point and banned the games. Thus, St. Telemachus' place in Christian history is as the one responsible for ending the gladiator games. At that point, Ulysses has his men stuff beeswax in their ears and has himself lashed to the mast of his ship, all the better to resist the tempting song of the sirens. I think all that is supposed to have happened along the Amalfi coast (well before there was an Amalfi, of course). My friend, Bill, got his good ship, Down East, into the water at Nisida in the Bay of Pozzuoli the other day and set out for Amalfi and beyond. He made it across the Bay of Naples in good time, rounded Cape Campanella and headed by the small isle named Li Galli, but originally Sirenuse, from the shores of which the sirens Ligeia, Leukosia, and Parthenope made their futile pitch. Bill reports that you can still hear police and ambulance sirens from the Amalfi coast road if you sail close enough to shore. Also, sailing—that was the real problem. The local maritime wisdom that the wind dies down at noon along that coast ("…as though some power lulled the swell…") and makes you break out the oars turned out to be true. Just past the cape and just off the magic isle, the wind died and Bill had to break out the engine. Ah, there is nothing like the smell of diesel fuel at sea to make you sing with Tennyson that you aim "to sail beyond the sunset, and the baths of all the western stars". The tiny island of Procida lies inconspicuously moored next to its big sister, Ischia, in the Bay of Naples; yet, even this little isle has a smaller relative: Vivara. Separated from Procida by a few meters of water and now connected to it by bridge, Vivara, a crescent-shaped remnant of the rim of an ancient volcanic crater, is now a nature preserve, one of the last unspoiled bits of greenery and wildlife havens in the area —and as a result of recent archaeological work, a place to catch a glimpse of the first great civilization of the ancient Greeks: Mycenae. In 1470 B.C. the Greek island of Thera exploded and put a cataclysmic end to the grand Minoan civilization of nearby Crete. In a sense, it was the end of what might be called the “southern dimension” of great early cultures, the last link in a chain that had started with the Sumerians and carried on through the Babylonians, Egyptians and Minoans. The end of Crete left a void that would be filled by the proto-Greeks, a branch of the Indo-European peoples who a few centuries earlier had started drifting south into the Greek mainland. By 1400 b.c.—a thousand years before Aristotle and Plato, and many centuries before the great city-states of Greece or any of the renowned Greek cities in Italy such as Cuma and Paestum—these early Greeks had formed a league of separate kingdoms centered on Mycenae on that part of the Greek mainland known as the Peloponnese. This is the civilization from which stems much of our vast Greek cultural heritage and familiar repertoire of Greek mythology; indeed, Mycenae—today a small town near the original site, a few miles inland from the Gulf of Argolis in the foothills guarding the road to Corinth—was the home of “proud Agamemnon” who rallied his fellow princes to sail forth and besiege Troy to avenge the abduction of Helen in 1200 b.c. Mycenae, then, turned out to be the dominant Mediterranean civilization for almost 400 years, from 1450 to 1100 b.c., and though there was not yet a single major city anywhere in Italy (the first would be built by the Etruscans in about 900 b.c.) the Mycenaeans carried on flourishing trade with small outposts scattered on Sicily and the islands and coastal areas of southern Italy. One such outpost was Vivara. The Bronze Age inhabitants of Vivara of 1500 BC looked out on a coastline and bay somewhat different than what we see today. Indeed, even since the time of the Romans—much less a millennium and a half earlier—the waters in the Bay of Naples have risen about 6 meters. 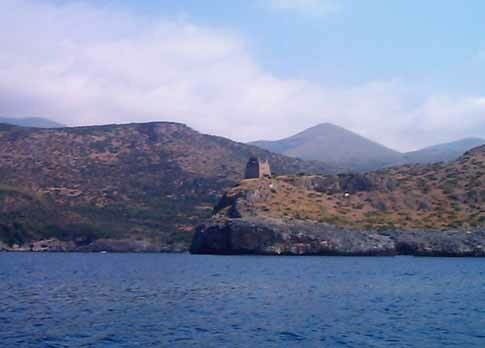 This accounts for the ruins of submerged Roman port facilities in nearby Baia, for example. Vivara, itself, was joined to Procida by land at the period in question. The first archaeological digs on the island (carried out in the 1930s) revealed remnants of a system of Bronze Age huts on what would then have been the plateau of the island as well as on the heights. One of the most interesting finds at the time consisted of two clay jars bearing traces of ornamental varnish—interesting in that they were of the same type as found on Filicudi, an island further to the south in the Aeolian archipelago north of Sicily. It was pottery of a type clearly Greek/Mycenaean and datable to the middle of the second millennium before Christ. Mycenaean pottery—as well as the produce it contained, such as wine and olives—was known to have been highly valued and to have been exported throughout the eastern Mediterranean and at least as far west as Sicily. 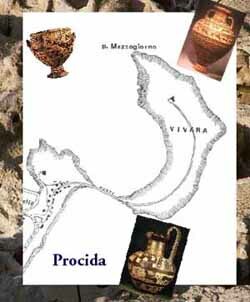 Such finds on Filicudi and then on Vivara are now taken as evidence of trade between Mycenae and Italy even at such an early date, trade supported by a network of coastal and island trading posts. Much of that commerce was concerned with the search for metals, and on Vivara, besides ceramic shards, remnants of habitations, jewelry and bits of weaponry of early Greek origin, there are signs that the area was, indeed, mined for copper at some time in the distant past—and there even appears to have been a foundry of sorts. This would be in keeping with collateral archaeology elsewhere in Italy, which indicates that the peninsula was somewhat of a Bronze Age mine for Mediterranean cultures to the south. Starting in the early 1990s, archaeological research on Vivara has been in collaboration with the Orientale University of Naples and the Naples Superintendent for Archaeology. It is work undertaken with enthusiasm and intensity by university archaeology students on the site. Their recent discoveries include the floor and collapsed tile roof of a large structure, uncovered half a meter below the surface; also, they have found a series of clay tokens of varying shapes and sizes. The tokens were stacked and had apparently been joined by a long-since decayed ring of some sort, indicating that they were used as a means to keep track of merchandise and transactions. A few doctors and other staff of the San Gennaro dei Poveri hospital in Naples (San Gennaro is the patron saint of Naples; dei poveri means "of the poor") cleaned up the ancient and purportedly original tomb of the saint near the hospital grounds the other day. It is a catacomb-like affair embedded in the side of a hill. The paper complimented the good deed, which was done in the spirit of the city's annual "Monuments in May" display of historic treasures, but remarked that in typical fashion, the tomb will now no doubt remain closed for another 50 years—the amount of time that had passed since the last time it was cleaned. The hospital, itself, is interesting, historically, but totally neglected compared to the medieval and Baroque points of interest in the main part of the city. It is very much off the beaten track and not at all in a part of the city that you and I would choose to stroll around—the Sanità zone of the city just beneath the Capodimonte hill. Though it is now merely a hospital for the poor or indigent, historically it was the first Hospice for Poor. It was founded in 1667 and intended to be a great "poor house", a place for at least some of the city's 10,000 mendicant poor (that comes out to about six or seven percent of the entire population of the city of the late 1600s). It was a forerunner of the much more ambitious project along the same lines, the gigantic Royal Hospice for the Poor started by the Bourbons in the 1750s. The reasons behind the desire to build the poor house, properly called Ospizio dei Santi Pietro e Gennaro, shed some light on the worldview of people in that day and age, at least in this part of the world. The plague of 1656 had devastated the city, and a large segment of the population had died; those who could actually afford to do so simply moved out of the city; jobs went undone and the economy—not doing too well, anyway, in these late stages of the Spanish empire of which Naples was a part—was a disaster. The plague was generally viewed as divine retribution for the sins of the city, and one way to regain divine favor was to engage in votive building (such as the two large spires at Piazza del Gesù Nuovo and Piazza San Domenico Maggiore— both from the late 1600s) and the construction of charitable institutions such as the Hospice of San Gennaro. Many remembered the dying words of Orsola Benincasa (1547-1618), a Neapolitan nun, who predicted a severe punishment from God unless the city did something to help the poor. The hospice was never intended to accommodate the thousands of poor roaming the streets, but it did manage to handle about 800 at any given time. The plan was not just to build a gigantic soup-kitchen and flop-house; it was set up to provide shelter, food and education, including practical trade instruction, generally literacy and even music. Much of that philosophy was incorporated into workings of the larger Bourbon hospice in the 18th century. The plan, too, was to help clear the streets of the most obvious walking reminders of endemic poverty in the Naples of that period by making a distinction between the home-grown poor (that you could take care of in such an institution) and the wandering beggars from elsewhere (whom you could then keep—or try to keep—out of the city). The San Gennaro hospice did not fail, but it was obviously not up to the task. That is the main reason behind the later Bourbon hospice. Yet, the San Gennaro hospice was a useful social institution through the entire 18th and even much of the 19th century. Times change and such things as "poor houses" are not part of modern Western society's way of handling social ills. The hospice became, officially, simply a hospital in 1939. But it still does a job. A friend asked me recently if I had ever heard the story that the sculptor of the famous Veiled Christ within the Sansevero chapel had been "rewarded" by the person who commissioned the work by having his eyes put out so that he would never again create such a work of beauty! I said, no, that I had not heard that story—or even that kind of repugnant story—except in connection with Ivan the Terrible and a sculptor connected with the construction of the Kremlin (as I recall). The sculptor of the Veiled Christ was Giuseppe Sanmartino (1720-93). He created the masterpiece in question in 1753. His further works throughout the rest of his life are well documented in any catalogue of Neapolitan sculpture; they include prominent works in the monastery/museum of San Marino and the Naples Cathedral (Duomo). His last work appears to have been in 1792: a sculpture, Moses and Aaron and the Tablets of the Law, on the entrance of the Church of the Gerolomini. So much for that horrid story about being blinded. It set me to wondering, though, where my friend had come up with such a story. There are a number of encyclopaedia references and short biographical sketches of Raimondo di Sangro, Prince of Sansevero (1710-1771), the gentleman who commissioned the Veiled Christ for his family chapel. He is listed—when briefly—as an "inventor and the person who imported freemasonry into the Kingdom of Naples" and—when at length—with rambling descriptions of his reputation as a sorcerer, inventor, charlatan, alchemist, friend of Charles III of Bourbon, even lover of music. In that regard, he is said to have bought young boys with good voices from their poverty-stricken families and castrated them to preserve their fine soprano voices as castrati—in search of the "primordial androgyny". God help us. Even the infamous Count of Cagliostro at his trial before the Inquisition court in Rome in 1790 is said to have claimed that everything he knew about the evil arts and alchemy he learned from di Sangro. Raimondo di Sangro was no doubt the kind of mysterious and powerful person that inspired awe among the masses of the mid-1700s in Naples. A good description to that effect is found in Benedetto Croce's Storie e Leggende napoletane. Croce says that di Sangro—for the masses that live in the narrow by-ways of the inner part of the city where the chapel is located—was the perfect comparison with Faust, who sold his soul to the devil for magical powers. Croce repeats a number of rumors about di Sangro: that he murdered seven cardinals of the church and had furniture made from the bones and skin; that he could reduce metals and marble to dust by touching them; and—here it is—that he had the eyes removed of the sculptor of the Veiled Christ. That remarkable piece of sculpture, by the way, always evokes the same comment: How did he make the veil? How is it that you see the features of the Savior beneath the veil? Did Sanmartino sculpt it that way? How is that possible? One hypothesis is that the finished staute was covered with a cloth and that the cloth was permeated with a solution that crystalized as calcium carbonate, creating the veil. Only Sanmartino knows for sure. A person to be admired, born to dare…illustrious in the sciences, mathematics and philosophy, unsurpassed in discovering the secrets of nature and esteemed master of the military arts…this temple is dedicated to his everlasting memory. Most students at one time or another have had the feeling that the professor up there in front was rambling on in a foreign language. And so it really was for many centuries in European universities, where lectures were routinely held in Latin. Antonio Genovesi's students of political economy at the University of Naples in 1755, thus, must have been pleasantly surprised when the professor delivered his lectures in Italian. He was "the first," according to a number of sources, though it is not clear exactly what that means—the first in Naples, the first on the Italian peninsula, the first in Europe. It is not even clear if he lectured in the northern language of Dante or the home-grown Neapolitan variety of Italian, a vibrant and living language at the time with an impressive literary history of its own. Whatever the case, it still made old (he was 43!) professor Genovesi a pretty good guy, I'm sure. Genovesi was one of the prominent members of the Neapolitan Enlightenment of the mid-1700s, a school that includes Gaetano Filangieri, Vincenzo Cuoco and Vincenzo Russo . As a young man he was educated for the church but gave that up. He then studied law but eventually devoted himself to philosophy. That is not as abstract as it sounds. Genovesi wrote the first systematic and complete work in Italian on economics, his Delle lezioni di commercio (1767) and was, in fact, the first professor of the newly founded Chair of Political Economy in Naples in 1754, the first such chair at a European university. He stressed that human wants were the foundation of economic theory and that labour was the source of wealth. He preached the education of the masses (no doubt the reason behind his lectures in Italian) and the abolition of feudalism. He wrote his early works in Latin: Disciplinarum metaphysicarum elementa (1743) and Elementa artis logico-criticae (1745). His major work, the Lezioni di commercio, was in Italian, as was his Philosophical Meditations (1758). He was born in 1712 and died in 1769. The Museum of San Martino is one of the most evident landmarks in Naples—a huge, white ex-monastery perched on the Vomero hill, visible from almost everywhere in the city and from all points on the waters of the Bay of Naples. What is not so evident is that the area directly below the museum, extending around the slope to provide a 260-degree panorama to the east, south and west is a 20-acre oasis called the Vineyard of San Martino. The vineyard rises steeply from 300 feet above sea level to 600 feet through a series of terraces, starting from in back of the buildings along the street named Corso Vittorio Emanuele and stopping directly at the wall of the museum itself. Originally, the grounds were part of the monastery, a vast area set in isolation above the city. That situation prevailed for centuries until the late 1800s when the newly unified Italian state passed a series of laws expropriating a great amount of property belonging to the Catholic church in Italy and, thus, essentially closing many monasteries. Since the late 1860s, San Martino has been a museum owned and operated by the state. The vineyard is in private hands, however, and the owner seems intent on keeping it intact, isolated and as green as possible. The division of the vineyard from the old monastery in the late 19th century unfortunately led to the lack of an integrated plan to care for the grounds, particularly where run-off from rainfall on such a steep slope is concerned. There have been a number of earthslides over the last century, with water building up behind some terrace walls and then eventually bursting them. Restoration, however, of a large section of the terrace walls below the museum is in progress, and much of the property is still under cultivation as a genuine, producing vineyard. The most striking thing about the vineyard is that it rests above a city of millions, yet it is pastoral, almost surreally so—an unexpected patch of green and quiet. 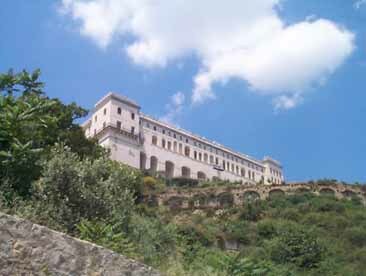 The most striking building along the Riviera di Chiaia, the road bounding the north side of the Villa Comunale on the sea front between Mergellina and Piazza Vittoria is certainly the Museo Principe di Aragona Pignatelli Cortes, known to Neapolitans, simply, as Villa Pignatelli. In 1826, Ferdinand Acton entrusted to Pietro Valente the task of building a Greco-Roman style residence that would then, in the English fashion of the day, be the centerpiece of a park. 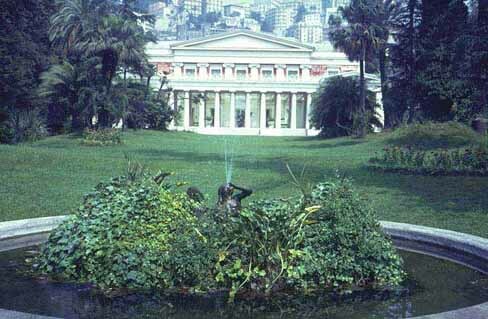 The intention of Valenti and the owner was to create a kind of Pompeian villa with the central atrium moved to the front of the building where Doric columns would then provide the only opening onto the gardens. The magnificence of these columns still strikes the eye of the casual passer-by today from the avenue fifty yards away. The property has changed hands a few times since the construction of the villa. It was bought in 1841 by Karl Meyer von Rothschild of the German family of financiers; then in 1867 it came into the hands of the Duke of Monteleone, Diego Aragona Pignatelli Cortes, whose widow then willed it to the Italian state in 1952. The villa today has managed to preserve and maintain intact the fine gardens in front of the building. The grounds house a coach museum, a collection of French and English vehicles from the eighteenth and nineteenth century. It is also the site of numerous art shows. The urban renewal that swept Naples in the last decades of the nineteenth century went by the pleasant name of ‘Risanamento', meaning, literally, ‘making healthy again’. In the name of achieving this worthy aim, a large number of old —even ancient— structures were cleared away. In some cases, the results were quite pleasant; a case in point would be the magnificent Galleria Umberto finished in 1890. Some controvery, however, surrounded the massive clearing of a wide swath of buildings between what is now Piazza Giovanni Bovio (called, simply, Piazza della Borsa—the stock exchange—by most Neapolitans) and the central train station, over a mile away, in order to build a broad and modern boulevard named Corso Umberto and called by most the rettifilo— the straight line. Cutting the downtown area in half separated the port area and the old Market Place from the rest of the city. Whether or not that was truly the solution to what seemed like intractable conditions of overcrowding, it was done—much in keeping with similar urban renewal projects in other European cities in the same period. The Italian word for the operation is sventramento, meaning “gutting”. The negative connotations of that world were lost on no one. The architectural results, paralleling the social results, were by general consensus, mixed. Piazza Bovio, itself, is dominated by the Stock Exchange building. It was built in 1895 and is the work of the architect Alfonso Guerra. Only after it was decided that there would be no place for such a building at Piazza Municipio was the Stock Exchange built at Piazza Bovio. The center of the square used to showcase the Fountain of Neptune, a work from 1601 by Bernini and Naccherino, done to a design by the great Neapolitan architect Domenico Fontana. That fountain has now been moved back to one of its previous sites on via Medina near Piazza Municipio. From Piazza Bovio all the way to the train station, thus, there is an unbroken chain of similar, somewhat monotonous, turn-of-the-century architecture, with a few pleasant exceptions such as the neoclassical main building of the University of Naples, located one block away from Piazza Bovio on the north side of the street. Further on, similarly, there is an interesting configuration of four identical buildings occupying the four corners of Piazza Nicola Amore. They are called the "quadruplets" by Neapolitans. I had one of those revelatory moments the other morning, where you step back and really look at something for the first time and notice it instead of strolling nonchalantly by. Just off of Piazza Vittoria, the square on the seaside at the east end of the Villa Comunale, is a street named via Calabritto; it runs for one block to Piazza dei Martiri. I looked up at it for a second and it hit me: this building isn't on the block—this building is the block. From the main road to Piazza dei Martiri, the building—named Villa Calabritto—occupies the entire east side of the street. It is three stories high, but these are three 18th-century stories, each one almost twice as high as a modern one. The entrance is framed by classically clean columns with a lovely arch over it; the entrance is at least 25-feet high and wide enough let a coach pulled by, say, a team of four horses turn easily in and through to the courtyard. I walked into the entrance and said something intelligent to a gentleman standing there. I think I said, "Gee, some building, huh?" He smiled and said, "Vanvitelli". Vanvitelli was born in Naples, the son of the Dutch painter Gaspard van Wittel; thus, "Vanvitelli" is an Italianization. 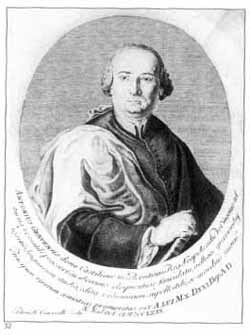 Vanvitelli studied in Rome and gained a reputation there before moving back to Naples: he designed the façade of the church of St John Lateran in 1732, worked on the consolidation of the dome of St Peter's in the Vatican, and helped decorate the Fontana di Trevi. In 1751 he moved to Naples to work for Charles III of Bourbon. Vanvitelli's best-known work is the Royal Palace at Caserta, the so-called "Versailles of Italy". In the city of Naples, itself, he helped redesign the Royal Palace in 1753, the magnificent building that fronts on Piazza Plebiscito and sits on the site of an earlier Spanish vice-regal residence built by Domenico Fontana. In the 1760s he redesigned the square now known as Piazza Dante and built the ornate semi-circular building, now a boarding school named for Victor Emmanuel II, that bounds that square on the east. Vanvitelli was so prolific in Naples and, indeed, throughout Italy, that Palazzo Calabritto is as neglected as an afterthought on most lists of his works. He set to work on it in 1756, essentially rebuilding an earlier structure on that site. 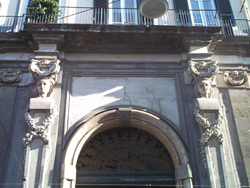 The main entrance, mentioned above, is now on one of the side streets leading to the main square, Piazza dei Martiri. If you walk the length of the block to that square and turn the corner, what used to be the servants entrance now sits on the main square. The main entrance and secondary one have two separate street addresses, but the building is one, as you can see if you walk in either entrance to the courtyard and look at the entire building from the back, as it were. Nothing marks the building as a work by one of the greatest of all Italian architects, and though the façade seems to have been redone recently—or at least cleaned—Palazzo Calabritto shows signs of neglect. One of the main concerns for people interested in preserving this treasure is the subway train line construction going on along the seaside. Plans call for a tunnel—considerably below sea level—to go beneath the street named Riviera di Chiaia for the entire length of the park (the Villa Comunale) and then turn in and tunnel beneath (!) Palazzo Calabritto to a new station at Piazza dei Martiri. Neapolitan folk tradition says that the origin of the surname "Esposito" is to be found in the past participle of the verb "esporre", that is, "esposto", meaning "exposed" or "put out for display". Thus, originally, so the story goes, abandoned children—left perhaps in a church—were "exposed" and those with that surname can be traced back to a foundling at some point. 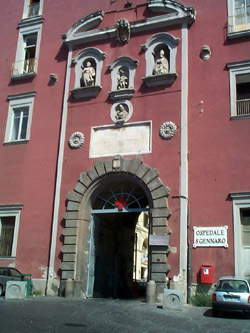 Generally, infants who were abandoned in Naples were left on the premises of the Church of the Annunziata (photo) in the old section of town, not too far from today's Piazza Garibaldi and the main train station. Indeed, there are also a great number of people in the Naples phone book with the surname "Annunziata," so that, too, may have a similar etymology. I have also heard the strange, quaint (? )—definitely weird—tale that on the premises of the Church of the Annunziata, which included a large orphanage, there was at one time a small, revolving Ferris-wheel-type affair with basket-cribs in place around the perimeter that each held a child. Periodically, the wheel would be put out and if you wanted a child, you could "spin the wheel," so to speak, and look at what was available. (I don't know if that is a true story, but that is the way I heard it). The Annunziata, itself, goes back to the early 1300s and has always been, in one form or another, an orphanage. By the mid 1600s, it was a full-fledged home, church, hospital, and school for such children. In the 1750s, under Charles III, the entire premises were completely remodeled by a team of architects that included Ferdinando Fuga, who built the giant Royal Hospice for the Poor, and Luigi Vanvitelli. The façade of the church is by Vanvitelli, as is the dome. The church interior is highly ornamental and includes works, for example, by Giuseppe Sanmartino, the sculpture of the famed Veiled Christ within the Sansevero Chapel in Naples. Traditionally, children raised by the Annunziata, surviving the staggering infant mortality rate of earlier times, were called "children of the Madonna" and, in a sense, there attached to them a certain aura of privilege—as if they lived in a state of grace. I have read that the Annunziata continued to function as an orphanage until the 1950s, at which time state social services took over the task. As you approach the Sorrentine coast from the sea, they look like mere specks, indistinct bits of stone along the shoreline below the town and high on the slopes of Montechiaro to the north-east. These are the "Saracen Towers," a reminder of a time when the citizens of Sorrento had more serious things on their mind than how to carve those inlaid wooden souvenirs called intarsio. Other examples of these towers can be seen scattered all along the coasts of Southern Italy—indeed, from Gaeta to Amalfi, alone, there are more than 350 of them. Some may have been restored and partially incorporated into more modern buildings such that it is difficult to make out what they originally were. But as you sail south from Amalfi down the coast of the Campania region, past the many small modern harbors such as San Marco, Pisciotta, Marina di Camerotta, etc. and around Cape Infreschi just before Scario, you come to a stretch of cliff faces and mountains along the coast that still have no roads and are still isolated. Once the backdrop of modern buildings disappears, the towers start to stand out—distinct, visibile and lonely (see photo). They are posted, in some cases, just a few hundred yards apart, thousands of them ringing all of southern Italy. The Norman founders of the Kingdom of Two Sicilies started building them in the 11th century and the Spanish viceroys of the same kingdom were still building them 500 years later. They all served the single purpose of watching for an enemy more feared than even the Goths and Huns who had destroyed the Roman Empire —the Saracens. "Saracen" is a vague word; it is possibly a phonetic corruption of 'Syrian', but what it meant to Italians in the Middle Ages was 'Moslem Invader', whether the Arabs who rode the initial wave of Islamic expansion into Spain and Sicily in the 8th and 9th centuries, or the Ottoman Turks who conquered Constantinople in the 15th century. Indeed, after that traumatic event for Christianity, the front in the war between the two faiths moved decisively to the West, and though Moslem thrusts into Europe by the 16th century were largely just harrassment, people here still remembered that the Saracens in the past had more than once attacked even Rome, itself. The word "Saracen!" was enough to set the population trembling, for it was very often the towns along the Sorrentine and Amalfi coasts that bore the brunt of raids by the likes of Khayr Ad-Din, the feared pirate known as "Barbarossa"—Red Beard. One of the advantages of living in a big city on a seacoast is that you don't have to hunt down green urban oases to get away from it all. Those patches do exist in Naples, to be sure—the Villa Comunale, the Floridiana, the Vineyard of San Martino , the grounds of the Botanical Gardens or the Museum of Capodimonte—but the quickest way is just to get on a boat, preferably a two-hour cruise up the Posillipo coast to the Isle of Nisida and back, but even a ferry boat along the same route over to the island of Ischia will do. Even a row boat—but get out there. The Greeks first named the rocky, wooded height at the western end of the Bay of Naples Pausylipon, meaning "place where unhappiness ends". 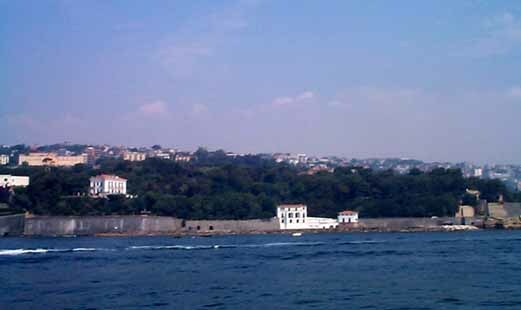 The area remained largely undeveloped until a road, via Posillipo, was built between 1812-24. That road starts at sea-level at the Mergellina harbor and moves up the coast, roughly parallel to the shore, but it actually angles up for over two miles to the cliffs at Cape Posillipo some 200 meters above sea level. Additionally, the road angles in as it rises along the cliff; thus, by the time it wends its path to the cape, it has put a broad slope of land between itself and the sea. That is the slope, the broad swath of land, that you see as you glide west along the coast. 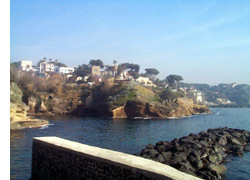 Towards the end of the Posillipo hill, near the cape, some of the land is still farmland and under active cultivation. The immediate impression along the whole stretch is of disastrous overbuilding. That impression corresponds 100% to the post-war reality of the area. Photos from the early 1900s show a still largely wooded area with farmhouses scattered on the slope and villas along the coast. It is, however, rewarding to keep your eye on the string of villas that are at the waters edge (photo, right) . They are among the most exclusive bits of property in Naples and always have been; that is, near the cape, there are Roman ruins at waters edge. Higher up along the cliff face, just before the cape, you can even see the openings of the air-shafts that ventilated the Seiano Grotto that led to the residence of Vedius Pollio and even catch a glimpse of his amphitheater on a height. The houses at water's edge all have at least small piers or landings, and there are even a few small coves with breakwaters along the way. These small harbors are the nuclei for separate, named communities such as Marecchiaro and Gaiola. Among the many residences, fabled and not so, along the coast, one that most attracts the eye is the Villa Rosebery (photo, left). It is about half-way up the coast and is a fifteen-acre wooded area dotted with a few smaller buildings such as "Small Guest House," "Large Guest House," "Seaside Cottage" and the main building, still referred to—in spite of the anachronism—as the "Bourbon Palace". It is, today, the official residence of the President of the Republic of Italy when he visits Naples. The estate rises over 100 feet from sea level to the back of the property. It has a very mixed history. In 1801, an Austrian admiral in the fleet of Bourbon Naples, Josef von Thurn (one of the officers on the court-martial board that condemned Caracciolo to death in 1799—see here) bought the land and built on it. It was confiscated by the Bonaparte government of Murat in 1806 but returned to the admiral after the Restoration in 1815. He sold the property and in 1857 it came into the hands of Luigi di Borbone, the brother of the king of Naples. He called the property la Brasiliana in honor of his wife, the sister of the emperor of Brazil. At the unification of Italy and the exile of the Bourbons, the property went through a succession of sales and in the 1890s was bought by Archibald Philip Primrose, 5th Earl of Rosebery (1847-1929), and British Prime Minister for the short Liberal stewardship of the government in 1895. He was witty, articulate, gave his name to this beautiful estate on the Posillipo coast, fashioned much of the property along the lines of an English garden, and then generously donated the property to the Italian state. Among his other notable achievements, Archie owned and raced horses and was apparently the only man to win the Derby while serving as Prime Minister. He wasn't the jockey, I don't think, but he did own the horse. I can't find where Mona Lisa used to live in Naples. Her surname—"Gualanda," according to one of the many theories—is not even in the phone book, so maybe the family has moved since 1500. I was so looking forward to making one good prank call. What, you ask, are the outstanding mysteries in the history of art? Well, what is Rodin's The Thinker really thinking? Why is the Night Watch so dark? These are puzzlers, yes, but the tough ones have to do with Leonardo's painting erroneously known in English as Mona Lisa (it should be Monna, a short form of Madonna, My Lady—but we even spell mamma mia as "mama mia," so what can you expect?). First, why is she smiling? Second, who was she? The Why of the Smile is anyone's guess. 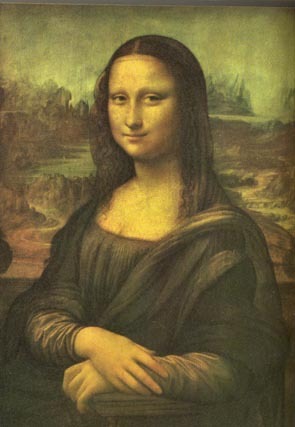 Nineteenth-century art historian Walter Horatio Pater said that the Gioconda Smile was the smile of one "who has learned the secrets of the grave." (That revelation, they say, drove late Victorian Romantics—a notoriously melancholy bunch, anyway—even further into white-hot frenzies of suicidal ecstasy.) One recent contribution to scholarly thought on the subject was from a French art historian who appeared on Italian television and claimed—with the help of an anatomical chart—that the Smile of the Ages corresponded to the curve of the human spinal cord, roughly from the juncture of the first and second lumbar vertebra down to the sacrum. Naturally, you have to rotate the spine 90 degrees from the vertical—or ask Mona to lie down— or you'll wind up with the Frown of the Ages, but essentially that's it: Leonardo da Vinci used someone's backbone (his own?) as a model for the painting. The Who question is just as interesting and, probably, just as much up for grabs. It is a sure thing that Leonardo did a portrait of one Lisa Gherardini of Florence in the years 1503-1506. She married Francesco del Giocondo; thus, the other name for the painting, La Gioconda—the "playful one"—is a solid pun on her married name. That painting is first mentioned and described by Giorgio Vasari in 1550 in Le Vite de’ piv eccellenti pittori, scvltori, e architettori (Florence 1550). He also identified the model as the "wife of Francesco del Giocondo". The problem seems to be that other 16th-century descriptions of the work don't really fit the painting we all know and wonder about. Combine that with a reference by one Giovanni Paolo Lomazzo at the end of that century to Leonardo's painting of a "Neapolitan Monna Lisa" and you may be led to the conclusion that there is more than one painting and, possibly, that the one in the Louvre is not the "wife of Francesco del Giocondo" but someone else. 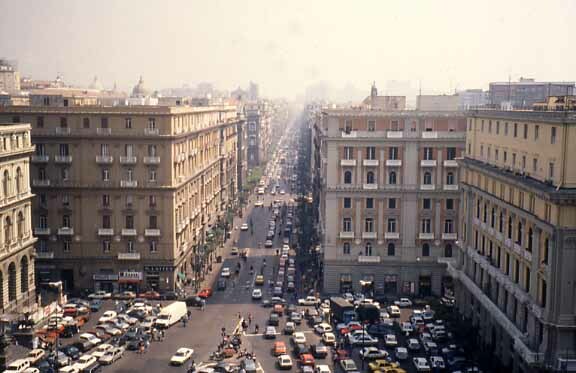 An article by Fiorenzo Laurelli in the Rivista Storica del Sannio 2000 sums up the case for Naples by citing Carlo Vecce's 1990 article, "La Gualanda," in the Journal Of Leonardo Studies. The Neapolitan model for the painting on display in the Louvre, says Vecce, was Isabella Gualanda, born in Naples in 1491. Her mother was Bianca Gallerani, one of Leonardo's models in another work, la dama dell'ermellino. Isabella was orphaned and raised at the Aragonese court. She went to Florence in 1514 and, in that year, sat for the famous portrait. Vecce's argument is fortified behind ramparts of exhaustive research and scholarly references. But there is still no Gualanda in the phone book.